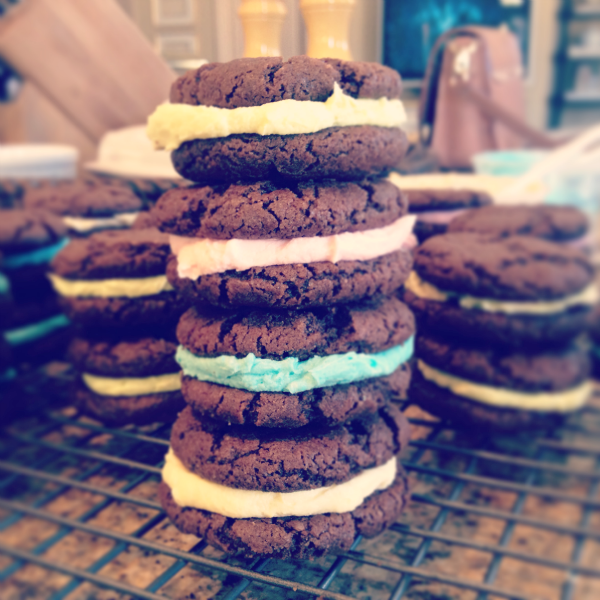 It is only appropriate these cookies be my first recipe post. I first made these homemade oreos with my sister after we saw the recipe over on Emily's blog. I hadn't made them in a while so a couple weeks ago I decided to make them for Easter. This of course meaning dyeing the cream filling to the appropriate Easter colors. When I brought them back to school, I was pleased with everyone's response. They loved them. The box full of cookies quickly disappeared as they sat out in my room at school. I knew would be going home the next weekend, so another batch of cookies was on the to do list. These cookies couldn't be simpler to make and I'm telling you everyone will love them. The recipe says to mix the cookie dough in a food processor which is what makes them so simple, but if you don't have a food processor a hand or stand mixer will work just fine! Below is a copy of the recipe which can also be found here. In a food processor, or bowl of an electric mixer, thoroughly mix the flour, cocoa, espresso, baking soda and powder, salt, and sugar. While pulsing, or on low speed, add the butter, and then the egg. Continue processing or mixing until dough comes together in a mass. To assemble the cookies, in a pastry bag or large Ziploc baggie with the corner cut off pipe teaspoon-size blobs of cream into the center of one cookie. Place another cookie, equal in size to the first, on top of the cream. Lightly press, to work the filling evenly to the outsides of the cookie. Continue this process until all the cookies have been sandwiched with cream. Dunk generously in a large glass of milk. *I like to add a tablespoon of instant espresso or coffee granules because like Miss Ina Garten always says, coffee brings out the chocolate flavor in things (and if you know me well, I believe anything Ina tells me). 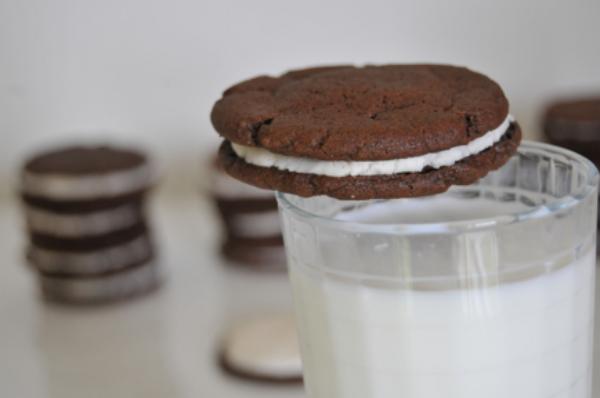 You can also control the amount of filling depending if you are a regular or double stuff kind of person. 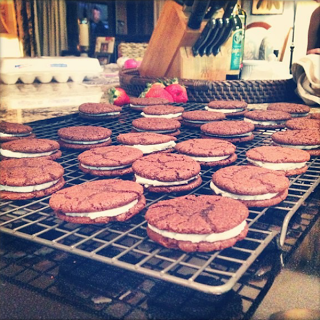 As for me, I don't believe in Oreos that aren't double stuff, so I generously fill them!